Samsung, the Korean tech giant is hosting an event next week wherein the company is expected to launch a new smartphone under its attractive Galaxy A-Series. To be called as Galaxy A90, the smartphone has been making some news in the market particularly because of the render images that has surfaced online. There have been several rumours and endless speculation about smartphone's design and hardware. If market reports are to be believed, Galaxy A90 will be Samsung's foremost handset with a rising camera. A new video has surfaced on the internet that not only reveals key specs but also suggests a slider mechanism with a rotating camera. Samsung Galaxy S10 5G Variant Launched in South Korea at $1,222. 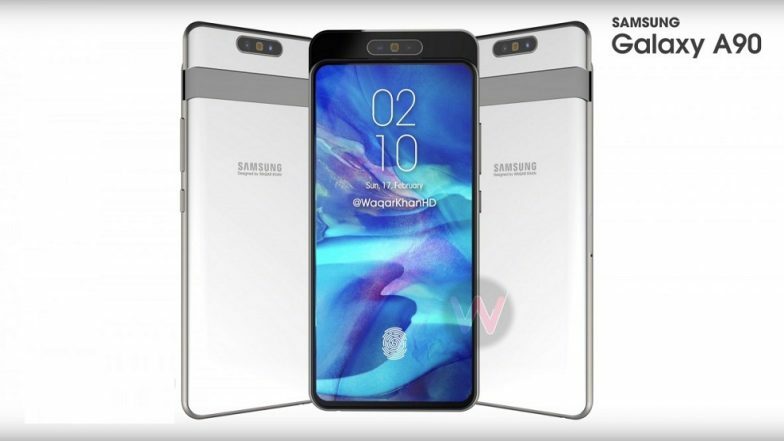 Going by the video, Samsung Galaxy A90 could carry notchless and bezel-less design which could be called as Notchless Infinity Display by Samsung. With no notch or punch-hole on the display, the phone maker seems to be totally relying on pop-up mechanism. The new Galaxy A90 reportedly will sport a 6.7-inch OLED display screen with resolution of 1080x2240 pixels. Under the hood, there will be a Snapdragon 7150 SoC, however there no details about RAM and internal storage as of now. To be backed by 3700 mAh battery, the phone will also support 25W PD fast charging. As per the new leak, the new Galaxy A90 will be equipped with a 48MP dual camera module at the back which will be a SONY sensor. The rotating camera module could be an ultra-detailed 48MP for selfies. This sounds impressive, but we will have to wait for an official confirmation on the same. All the details will unfold on April 10, as Samsung launches the new Galaxy A90.